What makes us buy one particular brand, instead of another? What is the difference between influencing and manipulation? Interested (and a little scared) by the power of some influencing techniques, I decided to investigate some of the principles of influencing. At first glance, something doesn’t quite feel right about the word influencing. For me it is linked to selling, marketing or even manipulation. On the other hand, being aware of what is being used to persuade me into e.g. buying something could protect me agains it. I would like to make my own decisions, based on what I find important, and not (only) on what others want. Is that at all possible? Well, maybe not, but I could at least try to be as aware as possible about what I base my decisions on. In the following video, professor Robert Cialdini explains what he sees as six universal principles of influencing. I visualised some of Cialdini’s messages in the video in the following scribble. 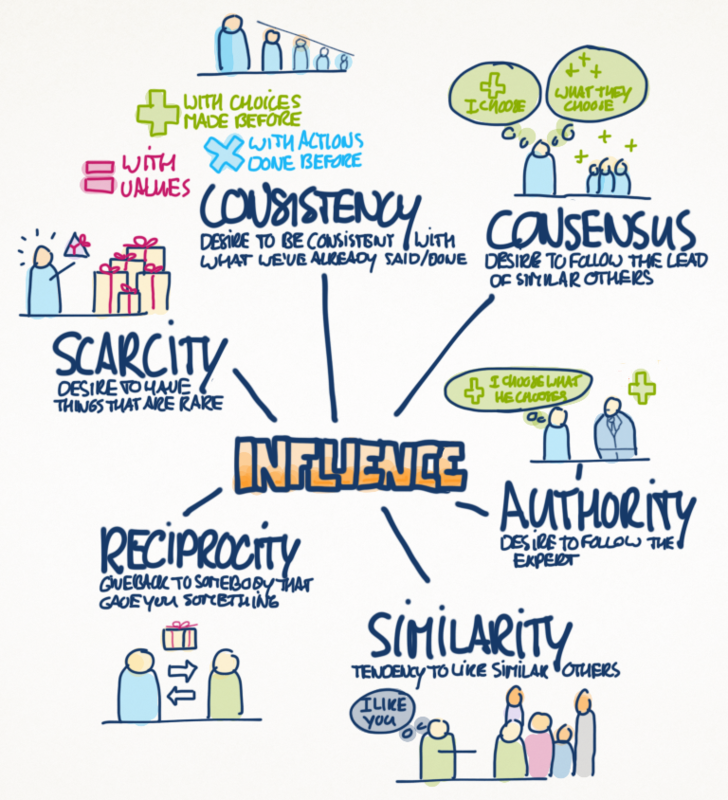 In upcoming posts I will explore the topic of influence further, along some of the six principles.